Opening Sentences: The piano stood quietly in the living room for years. Until the day Raj first plunked and pushed the keys, delighted by every sound. Find a piano, whether you’ve played before or not, whether you’ve been taking lessons for years or not. Explore the different sounds the piano can make. “Mix the notes the way you’d mix your watercolors” and see what lovely or scary or funny melodies you can come up with! Here’s a wonderful blog post from Peter H. Reynolds about Playing from the Heart. There’s a great question and answer video with Peter H. Reynolds on the Candlewick Press YouTube channel. 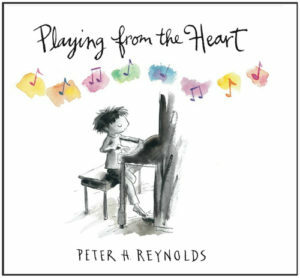 Click here for links to notes from various Candlewick authors – find the one about Playing from the Heart. Availability: Readily available at bookstores, libraries and online. How about going to an independent bookstore or ordering the book from a bookstore like Peter’s own Blue Bunny Books and Toys in Massachusetts?